EAST RUTHERFORD, NJ -- June 8, 2018 -- You could say Team Orange crushed it at the Meadowlands. The husband and wife team of Andy and Julie Miller – and 20-year-old son T.J. – all had a good time of it Friday night as the Julie-trained Double L Lindy won the feature, son T.J. won his first-ever Big M drive, and then for good measure, Andy scored in the eighth race with an 8-1 shot. Double L Lindy was superb in taking the $15,000, fifth-race conditioned trot. Driver Jim Marohn Jr. hustled the 5-year-old gelded son of Muscles Yankee-Love Lockdown to the top in :27.4. There was little stress for the eventual winner, only a far turn challenge from second-choice Misslarose, but it did not amount to much, as Double L Lindy reported home a safe three-quarter length winner as the 1-5 favorite over a fast-closing Pinkman. Misslarose finished third. The winner, who was coupled with Fly On in the wagering (Fly On broke on the far turn while racing in the pocket), returned $2.60 and completed the mile in a lifetime-best 1:52 for owners Little E LLC, Living The Dream Racing LLC and RBH Ventures Inc.
To top off the night, Andy guided Clifton Beach ($19.40, 1:56.1) to victory lane in the eighth race conditioned trot. A LITTLE MORE: Lack of interest in the entry box led to lackluster wagering on the program. On the comparable card from a year ago, a total of 84 horses competed in 10 races – an average of 8.4 starters per race – with a total wager of $2,137,916. Friday night, only 66 betting interests competed over nine races (7.3 per race) with all-source handle totaling $1,681,527, a decrease of 21.3 percent from the year before. 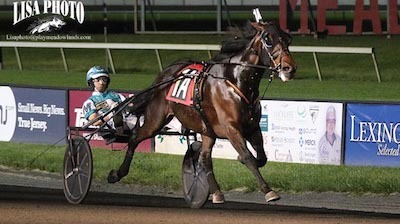 … The team of trainer Linda Toscano and driver Tim Tetrick won twice on the card. … The Late 20-Cent Jackpot Super High-Five failed to result in a single-ticket winner, upping the carryover to $250,090. … Gates open at the Big M Saturday at 10:30 a.m. with a big Belmont Stakes simulcast crowd expected. … Live racing resumes Saturday at 7:15 p.m.